Hearing stories of fields being irrigated, of food being delivered, of kids being educated, and of women starting their own businesses because they’ve got working electricity and can create more products to sell—that’s the human side of this story that matters most to us. IoT can simply replace the lack of hard-wired infrastructure just through cellular activity, making resources more readily available to those who need them most. It’s rewarding to know there’s a part we can play in making that happen. SolarNow provides solar-powered equipment, appliances, and services to remote or off-grid users in East Africa. The company began to identify common pain points for its users and areas where it could grow its business with better device insights and device optimization. 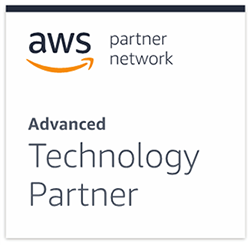 SolarNow engaged with AWS Partner Network (APN) Advanced Technology Partner Eseye to build connectivity into its devices using the Eseye AnyNet Secure SIM solution and IoT technology on AWS to measure device usage and draw insights into customer behavior. Using Eseye and AWS, SolarNow can drive better insights into customer device usage and service patterns, prolong device longevity, and improve device performance. SolarNow is a for-profit social business with Dutch origins that is passionate about transforming lives by providing quality solar energy products and financing solutions in East Africa. Beginning its operations in Uganda in 2011, the company has provided solar energy at affordable prices to over 35,000 customers. For many communities around the world, particularly those living off the electrical grid, energy access is limited and unreliable. Even when options like solar energy become available in these communities, there are often financing challenges that prevent the ability to harness this energy, which limits access and reliability. SolarNow envisions a better way to provide last-mile distribution of solar energy at an affordable price: by focusing on people first. “Our company is different because we started by looking at how we could solve accessibility and financing challenges for end users,” says Peter Huisman, chief technology officer at SolarNow. “We knew the technology was there and we sought to bring advanced technology together with viable financing options to provide a better solar energy service solution and thus more opportunities to our customers.” SolarNow addresses the unmet need for sustainable, quality solar energy in the region through the provision of solar-powered equipment, appliances, and services to remote or off-grid homes, farms, schools, health centers, and businesses. To make a deployment achievable, the company offers affordable and flexible credit with every solution, a key feature in widening access to solar energy in the East African market. As SolarNow’s customer base grew, the company began identifying areas for business growth and improvement. “Over time, we noted pain points for customers, such as a short battery lifespan or inefficient solar panel usage. We felt we could proactively address and prevent these issues using Internet of Things technology to build a connected device and monitoring solution,” says Huisman. SolarNow needed to be able to enhance access to and use of device data to remotely monitor system performance and alert customers of inefficient device usage. The team wanted to build cellular device connectivity and IoT technology into its solar solutions to address significant business use cases and have the ability to optimize device longevity, prevent service interruptions, identify and address recurring patterns in device challenges, collect and analyze data to improve customer service response times, and further credit provisioning through better insights into customer behavior. SolarNow began researching technology partners and providers who could deliver the expertise and guidance needed to build a cellular-connected IoT device management solution with reliable connectivity, scalability, and security. After evaluating SolarNow’s short- and long-term goals and technical needs, the Eseye team recommended that SolarNow migrate to AWS to take advantage of the global availability, scalability, and security of AWS infrastructure and native services like AWS IoT, while also helping SolarNow begin to update its hardware to use Eseye’s AnyNet Secure SIM solution. “For us, it was a no-brainer to leverage AWS to be able to scale and collect data in real time,” says Huisman. Eseye connects SolarNow’s devices with reliable global cellular network data through the Eseye AnyNet Secure SIM solution. The Eseye AnyNet Secure SIM is designed to be a one-stop global cellular connectivity solution. It connects SolarNow’s devices securely through multiple wireless network carriers who provide wireless communication services to end users. The SIM’s enhanced features, such as secure integration with the AWS IoT cloud, Bespoke Firewalls, and International Mobile Equipment Identity (IMEI) locking enable SolarNow to remotely and securely activate, provision, authenticate, and certify deployed devices over-the-air. To make it simple for SolarNow to use the AnyNet Secure solution, Eseye has integrated its services with the AWS IoT Core, which enables lifecycle management, certificate delivery, analytics, and anomaly detection at the click of a button. SolarNow’s devices communicate over the AnyNet Secure managed network into the AWS IoT Core. To keep costs down, SolarNow is able to access IoT Core through the AWS Marketplace, which offers subscription-based pricing and is managed from within the AWS IoT console. When new customers are onboarded and their systems registered, AWS IoT Core then creates the Thing and generates the certificate with all the required security material and device identity information, and through its integration with Eseye, delivers the certificate directly and securely into the secure file system in the SIM card using GSM signaling channels. Maintaining secure device connectivity is critical for SolarNow’s ability to thwart malicious activities and provide uninterrupted service to its customers. To provide intelligent device security management and monitoring, Eseye chose to integrate the AnyNet Secure SIM with AWS IoT Device Defender, a fully-managed service helping to secure SolarNow’s fleet of IoT devices by receiving connectivity usage metrics. Eseye creates device metrics in real time from the cellular network so that AWS IoT Device Defender can monitor normal behavior of the device, such as how many ports are open, who it can talk to, where it is connecting from, and how much data it sends or receives. Using the Detect features, any deviation from a set of predefined security profiles and behaviors will trigger a violation. Eseye creates device metrics in real time from the cellular network so that AWS IoT Device Defender can monitor normal behavior of the device. 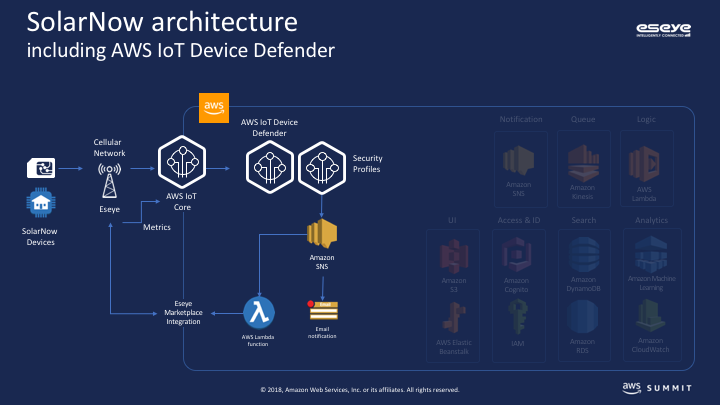 The AWS IoT Device Defender Security Profile classifies the severity of the violation and publishes it to a configured Amazon Simple Notification Service (Amazon SNS) topic. Amazon SNS invokes an AWS Lambda function that directly updates the IoT Thing Attribute to use the Eseye Marketplace integration to suspend the cellular service. Eseye’s pairing of AnyNet Secure SIM with AWS IoT Device Defender helps SolarNow monitor the security and activities of its devices. SolarNow is beginning to explore how it can use additional AWS services to collect more insight into customer usage patterns and proactively maintain devices. For example, the company is using Amazon Kinesis and Amazon Machine Learning to collect and process data streaming from its connected devices and identify and analyze patterns of consumption and use. SolarNow’s engaged with additional APN partners to build out its predictive analytics capabilities. “It’s been very easy for us to get access to other high-quality AWS technology implementors and providers who are a part of the APN,” says Huisman. Because SolarNow’s high level of customer satisfaction and its business reputation are built on its zero-tolerance for any controllable service disruption, the insights it’s driving with Eseye and AWS into customer device usage and service patterns is critical. Through its initial pilot of 150 units in Uganda, SolarNow is gaining vital insight into how its customers are using its systems and into device performance. SolarNow’s devices impact livelihoods for users across a diverse number of environments and use cases, including household appliances, irrigation pumps, and power supplies to schools and health clinics. 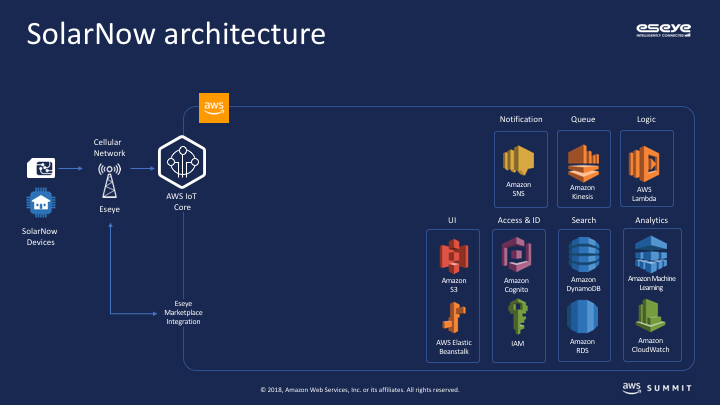 Learn more about how to build and deploy an IoT solution on AWS. Eseye is an AWS Advanced Technology Partner with IoT Competency. The company is a specialist provider of global M2M cellular connectivity, working exclusively with companies deploying IoT devices. Eseye provides an easy way to deploy cellular IoT devices onto the AWS Cloud using the AnyNet Secure connectivity solution.